Heavy blankets of white snow, friendly reindeer and fancy sleighs: even before it became the official home of Santa, it was a childhood dream of mine to go to Lapland. I was a kid in the 1980s, when people just didn’t indulge in such luxuries, so it didn’t happen, but now I have a three-year-old of my own to take along. Even though there are many pros to getting a package deal to Lapland — where everything is arranged and you get direct flights — it’s pricey, not much short of €700 each for a basic day trip, and more if you stay a night or longer. Romi and I, being rather partial to adventure, decided to fly to Helsinki ourselves and travel the 811km as far as Rovaniemi, capital of Finnish Lapland, by train (see the end of this article). It’s an 18km ride from the airport to the centre of Helsinki, and the fabulous St George hotel, where a room awaited us. As with all hotels in Finland, you can drink outstandingly good water from the tap. After spending too much time over breakfast next morning, we nearly missed our train. My trains tend always to depart from the furthest possible platform, and I nearly died of exhaustion getting us there. When we made it, we were pleasantly surprised to find a “playroom” carriage, which, despite all the children in it, was an altogether quiet affair. I put it down to the Finnish demeanour: Finns are, after all, the global overlords of parenting. Romi was the most animated tot on board. When we left Helsinki, a thin sheet of snow covered the frosty ground, but by the time we arrived in Rovaniemi, eight and a half hours later, rain was falling sideways. We were tired and emotional. There were no cabs. As my daughter passed out in her stroller, I channelled Steve Martin in the movie Planes, Trains and Automobiles in a mad dash for a passing taxi — almost beating a Japanese tourist to it, but not quite. I finally won a battle over a third cab. Rovaniemi is a small tourist town of just 60,000 people. Almost all the buildings were flattened towards the end of the Second World War, so it all looks relatively new. It has a lovely vibe and some gorgeous restaurants and hotels, all extremely child-friendly. Almost 1m visitors come annually and Christmas, obviously, is the busiest time of the year. After an early night — it always feels like 11pm in Lapland, because it gets dark at 2pm, not that it is ever really bright at all — we awoke to rain. I felt for the kids who had flown from Dublin and Cork just for the day, on their once-in-a-lifetime trip, to be met with Dublin and Cork weather. Nonetheless, we went on a husky ride at Bearhill Husky, 22km outside the city — on a cart with wheels. I missed the snow, but my daughter loved it. All the kids on the trip were delighted to see the many dogs at the kennels, and the children were provided with rainproof clothes and treats. At 2.30pm, when we finished, it felt like midnight. Romi and I were dropped off at the Arctic Snow Hotel, where we stayed in one of their glass-roofed igloos. I was particularly impressed with a button you press to alert you when the northern lights are due to appear. In my parallel universe, there would have been a blanket of snow and a glorious sunset, followed by the northern lights — all of it seen from the comfort of our beds — but it wasn’t to be. Northern lights are best seen in Rovaniemi between August and October when the nights get longer, but obviously not when there’s low cloud. After an afternoon nap, we at least awoke to snow, so we put on our ski stuff and headed out to play. It was only about -3C at this hour, but you do need proper footwear, gloves, thick socks and lined jackets when you visit. Tauriainen informed me that some people show up in wellies, and their toes nearly fall off. I was also glad I brought a headtorch to light our way through the around-the-clock darkness. We walked past the other igloos to a teepee-shaped building where dinner was served by a huge open fire, which was then used to toast marshmallows. After another nice breakfast, we missed the shuttle to town, but managed to hitch a ride to the centre with a German tour guide. I didn’t want to push for him to drop us at our intended stop, Hostel Cafe Koti, so I dragged a now broken wheelie suitcase, stroller with a three-year-old in it, and three bags across town. Finland, like other Nordic countries, boasts one of those equal societies where people leave you alone, hence no one gave me a hand — feminism has its downsides. Nonetheless, we ended up in glorious accommodation once again. Finland’s hotels seem excellent, whether you go five-star or hostel, with broadband everywhere. Regular buses from the centre bring visitors to Santa Claus Village, the epicentre of Christmasdom, 8km outside town (€5 return). It’s the highlight of most trips and a must-see for kids. Romi played on the swings, we ran around in the snow, and we queued for a reindeer ride. The wait was short and there was an open fire for more marshmallow grilling. We were thrilled when it began to snow, too. Our reindeer ride brought us through the forest. It was as romantic as I had imagined — we were over the moon. Then we went to the post office where kids post letters to Santa and saw the man himself. We only had to queue for about 10 minutes — handy when neither of you have any patience. Romi isn’t too familiar with the fact that Santa brings gifts, so when he asked her what she wanted for Christmas, she was speechless. I couldn’t think of anything either. The Village, like Lapland itself, is pricey. You pay upwards of €25 for a main meal and about €10 for an alcoholic drink. Cabs are expensive too, as are some activities. But you can get nice hotels for €100-odd a night, B&B. We felt content on our train journey back to Helsinki, flying past snow-covered forests, at last. “I would happily have stayed longer and headed further north, but we enjoyed the train journey back to Helsinki the next day, flying past snow covered trees at last. We had planned to go to an outdoor pool in the city centre the next day, but the weather was terrible and we were wrecked, so we just hung around the incredible Airport Clarion hotel in Helsinki, which served the best breakfast in Helsinki, where my daughter played with a car, rocking horse and selection of toys available at reception. Again, it’s the little things, the Fins are on top of that make a massive difference. It was a great decision to chill out as travelling with a child is exhausting. Lapland on a budget can absolutely be done, though with the caveat that four planes and six trains, plus cabs and buses, to cover 1,622km in six days — with a child — is tiring, and five different hotels meant lots of packing and repacking and lugging down hallways. I always say I’ll organise an easier holiday for us next time, and yet I never do. My daughter will only be young for a short time, and open to magic for so little of that, so it was a case of now or never. It was worth all the effort. 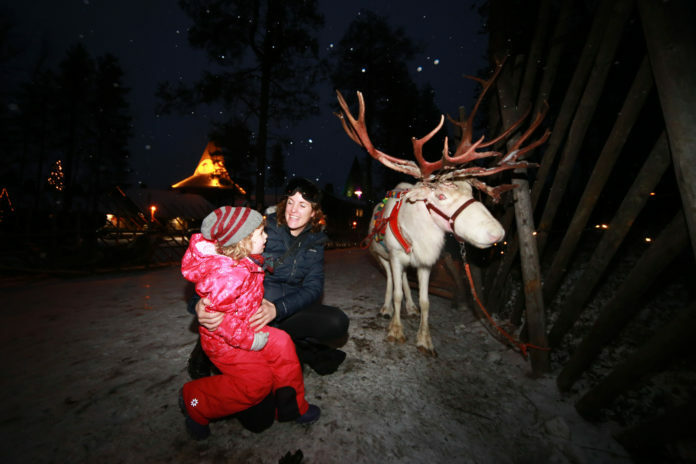 With thorough research, DIY bookings and a lot of patience, McCarthy managed to pull off a six-night trip to Lapland for herself and her three-year-old daughter Romi for a total of €1,400 — €700pp — excluding some meals and sundries.